Generally it is best to enter the water at the high tide time for Sydney (Fort Dension). You can have a longer dive on a small Neap tide. Watch out for strong currents on large Spring tides. At Seahorse Gardens the current eddies and often flows in a reverse direction. This site can be dived up to 2 hours before the tide, as current flows are weaker, and is a good dive at low tide. At Little Beach the current also eddies. This eddie dies away about 1 hr after high tide so it is sometimes more pleasant to enter the water up to 30 minutes after high tide at this site. Dives at Pipeline and Dutchies should be done later (5-10 minutes after high) as they are further down the bay. If you want a drift dive get in early. If you want a reverse drift get in late. The figure to the right shows the approximate flow rates for the currents entering the bay for the largest (Spring) and smallest (Neap) tides that occur during the year. The flow rates have been extracted from current data shown on the Marine Chart for the bay (AUS 209). The average diver is comfortably able to sustain a swimming speed of 0.8 knots and has a maximum swimming speed of ~1.5 knots for short periods. This has been used on the figure to show the approximate period when it is safe to dive given the strength of the currents. Based on the current speeds it is possible to estimate how long a diver can comfortably spend in the water, for a particular tidal range, without experiencing uncomfortably, or dangerous, currents. The table to the right shows the estimated comfortable periods and danger periods for a number of tidal ranges. It shows that on small Neap tides a diver should be able to enter the water and swim comfortably for a period of up to 60 minutes either side of slack water. However on big Spring tides currents will become uncomfortable if you are in the water more than 30 minutes from slack, and will be dangerous (impossible to swim against) if you are in the water more than 60 minutes from slack water. This raises the question of when slack water occurs in the bay. 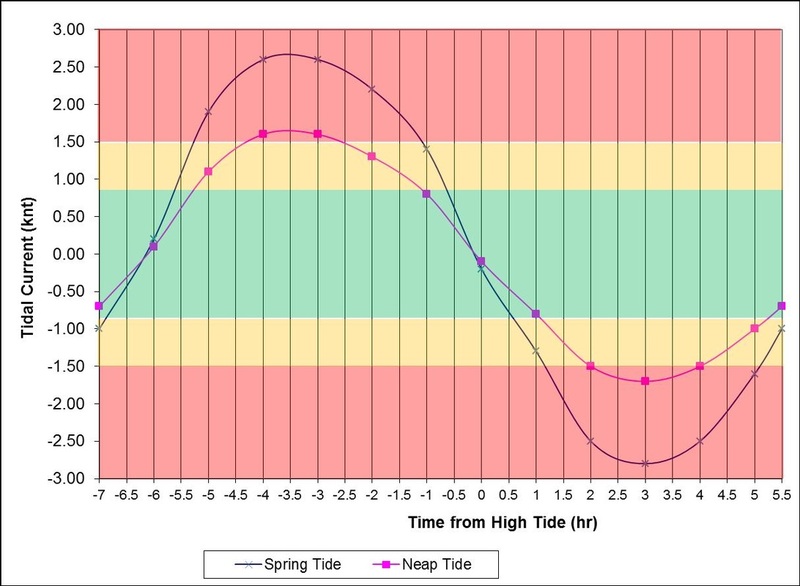 The tide charts give high tide in the bay as roughly 30 minutes after the high tide reported for Sydney (Fort Denison). Therefore if you enter at the time shown for Sydney’s high tide you will get in about 30 minutes before slack and will be able to have a comfortable 60 minute dive under most conditions, exiting approximately 30 minutes after slack.